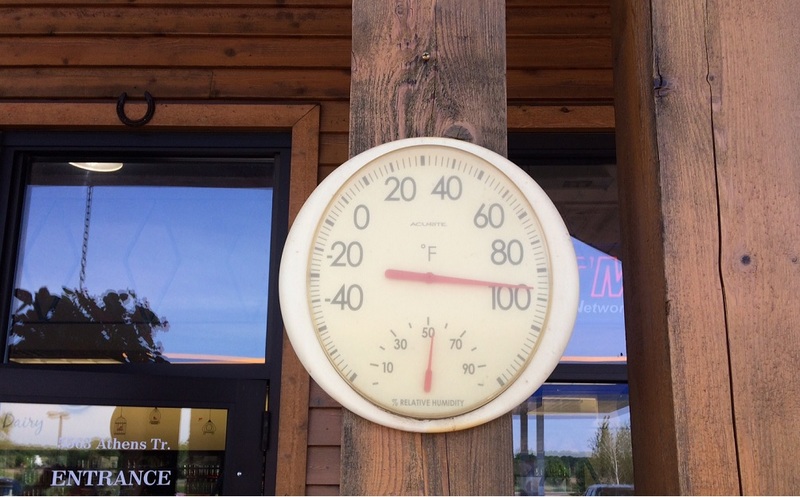 On May 28, 2018 the mercury reached 100 degrees at the Twin Cities International Airport. This is the earliest reading of 100 degrees at the official Twin Cities reporting site since 1871. A large area of high pressure entrenched across the midsection of the country set the stage for a pre-summer heat wave. From May 24-29, 2018 the mercury climbed at or above 90 degrees for six days in a row, the second most number of 90 degree maximum temperatures or higher in May for the Twin Cities, with only 1934 having more 90 degree days with eight. The 100-degree reading set the maximum temperature record for May 28, breaking the old record of 98 in 1934. The highest temperature found statewide was 102 at Madison in Lac Qui Parle County in west central Minnesota. The National Weather Service issued an Excessive Heat Warning on May 28 for Hennepin and Ramsey Counties. The common guidelines for the issuance of excessive heat warnings is when the maximum daytime index is expected to reach 105, and the nighttime low temperature does not fall below 75 or 80 degrees. The morning minimum temperature on May 28 was 77 degrees with the heat index reaching 101 in the mid-afternoon at the Twin Cities International Airport. Lakes that had ice cover at the start of the month were now sleuthed out by swimmers looking for an early dip at their favorite beach. Sales of ice cream treats were brisk. Strong thunderstorms developed in the southwest metro area on May 28, and moved to the northeast though the late evening. These storms only dropped .01 (a hundredth of an inch) at the International Airport, but the rain-cooled air caused the temperature to fall the mid-70s by dusk. The minimum air temperature for the day was 73 degrees near midnight. Tuesday, May 29 had one more day of 90s across central and southern Minnesota before more thunderstorms cooled the air. The Twin Cities tied a record high of 94 set in 2006 on May 29th. The streak of six 90 degree days in May is the longest stretch of 90 plus days in the Twin Cities, the previous record was four days set back in 1874, 1934 and 1988.